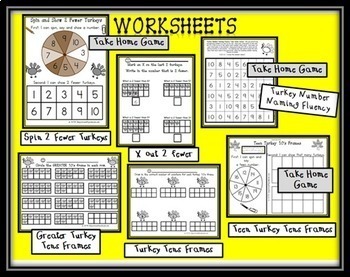 Use this 75 paged turkey file to help your students practice essential common core math skills like recognizing and matching numeral to amount, identifying the greater set, and comparing sets and finding 2 fewer. Each game contains color coded game boards so that 6 students can play at a time. Plus each color coded board is different so students can trade their boards and stay engaged practicing the targeted skill at the center for a longer period of time. 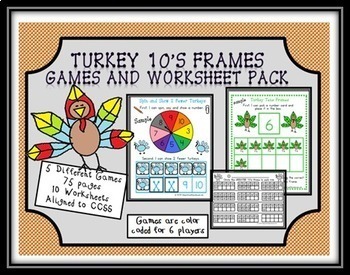 There are 5 different Thanksgiving themed games including: Turkey Tens Frames, Spin 2 Fewer Turkeys, Turkey Number Naming Fluency, Teen Turkey Tens Frames and Greater Turkey Tens Frames. Specially designed reproducible worksheets are also included that can be used as follow up practice or even assessment. 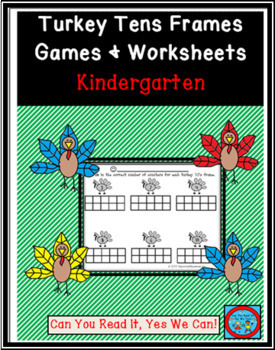 Parent take home games are included too to extend the learning fun at home! 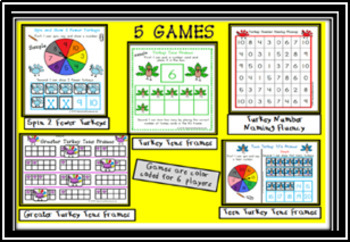 The games are great to use all at once in a rotation for a Thanksgiving Party Day! K.CC.6 I know if a group had greater than, equal to or less than another group. K.CC.7 I can compare numbers.